Lucky Street is on track for a Magic Millions double after returning to form in the LR Miss Andretti Stakes (1100m) at Ascot. The Oratorio flyer (pictured) started an odds-on favourite on Saturday and kept finding in front to defeat First Among Equals by a long-head. He was coming off an unplaced effort in the G1 Winterbottom Stakes and a close second in the LR Summer Scorcher. Andrews predicted the colt will be hard to toss with something to chase in the Magic Millions 3YO Trophy (1200m) at Pinjarra next month. He won the Magic Millions 2YO Classic and the G2 Karrakatta Plate during a championship season in 2014-15. 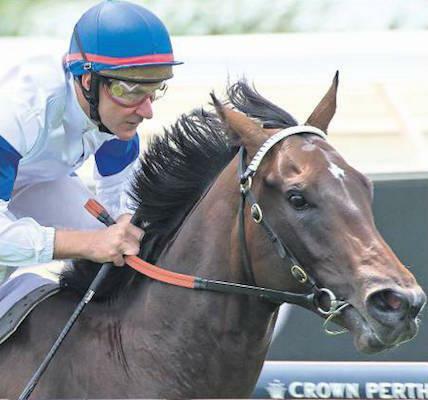 Lucky Street (3c Oratorio – Rumours by Umatilla) was a $75,000 buy from Mungrup Stud at the 2014 Perth Magic Millions and has earned $810,350 including Westspeed bonuses of $110,000 for a syndicate that includes Andrews, Ken Gregson, Isaac Cohen and Ross Drage. Oratorio is poised to break through the $1 million mark in earnings this season and he has 15 lots catalogued for next month’s Perth Magic Millions. The colt from Western Breeders Alliance (Lot 214) is the only yearling not being sold on account of Mungrup Stud.